The Rock has perfectly responded to Kevin Hart’s epic trolling on Instagram. 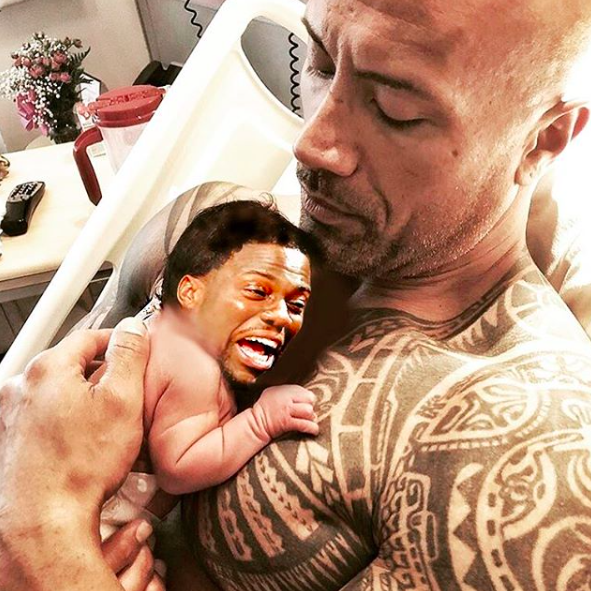 Days after Dwayne ‘The Rock’ Johnson and his girlfriend, Lauren Hashian, announced the birth of their baby Tiana Gia Johnson on Instagram, Kevin Hart posted one of the most creepy photos I’ve seen. The Rock went one step further and reposted the image but added a touch of poetry to it. He also posted a video with another daughter on International Women’s Day. Calling her his ‘Queen’, The Rock taught his daughter to say ‘Girl Power’, before telling her to say, ‘International Women’s Day’. This incredibly cute moment between father and daughter is just the kind of moment which The Rock’s daughters will no doubt grow up to love and appreciate about her old man. Girl power. To every woman out there ’round the world – all ages and races – I proudly stand by your side to always honor, protect and respect.